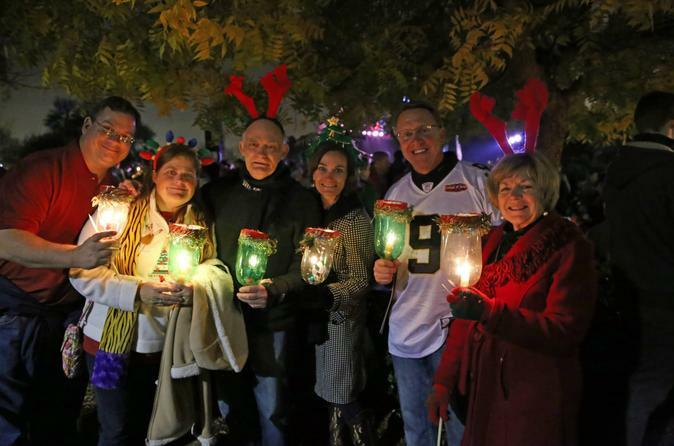 See New Orleans at the holidays and welcome Christmas with a guided stroll through the French Quarter on this festive, 2-hour 'Jingle Bells and Beer' walking tour. Enjoy the extravagant decorations throughout the French Quarter, with insightful commentary given by the tour guide. See places of interest like the St. Louis Cathedral, and other historic and cultural landmarks. Visit courtyards, cathedrals, restaurants, and shops, and hear stories of voodoo, ghosts, and vampires. With your group in tow, visit the city's decorated homes, churches, and museums while hearing the history and importance behind each location. Add a little extra spice to the occasion with a cocktail or two along the way (own expense) while exploring one of the oldest, most cultured, and historic neighborhoods in the country, complete with stories of New Orleans history, legends, voodoo, and vampires. Follow the guide through the magical streets of the Vieux Carre (the French Quarter), and pass historic and cultural landmarks lit up for the holiday season. Visit the exact location where the Louisiana Purchase was signed in 1803, see the famous St. Louis Cathedral, and discover many more places that played a vital role in the city's history. Of course, no New Orleans tour would be complete without stories of voodoo, ghosts, and vampires. A real EMF Meter - Ghost/Paranormal Detector will be used during this tour. Before this tour ends, know where to find the most predictable ghost in New Orleans. Along the way, check out the most haunted house in the city, and learn about the voodoo queen, Marie Laveau, while visiting property given to her as payment for her magic. After two hours exploring the Big Easy, your tour concludes.